It begins with a donkey, baptised by two children in accordance with the Catholic rite. Told like the life of a saint, through a series of vignettes, Balthazar’s journey provides the continuity throughout this film shot by Robert Bresson in 1965. The donkey passes from owner to owner, it pulls the cart for a cruel peasant, delivers bread for a baker under the violent rule of a young thug, accompanies an alcoholic tramp and even becomes the star of a circus act, before working for a miserly and sadistic grain merchant played by Pierre Klossowski. It brings to mind Mémoires d’un Âne by the Countess of Ségur, or Michael, Brother of Jerry by Jack London. 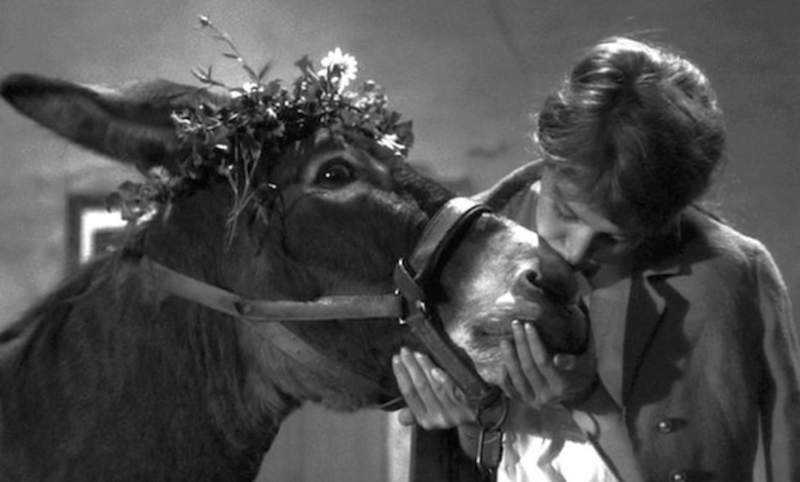 But Bresson’s donkey is not a character, through its gaze and its suffering, it demonstrates the hopeless struggle of the protagonists, dealing with their pride, their greed, their sensuality. A hand on the back of Marie’s neck, lace seen beneath her blouse, Balthazar’s legs trotting along the road: like the narration, the bodies and spaces are fragmented. Through its gaze and its mobility, the donkey moves from one shot to another, operating like the principle of film editing, restoring its unity and fluidity. Above all, Balthazar’s destiny matches Marie’s, the child in the first shot becomes a young girl played by Anne Wiazemsky, then aged 17. In 2007, in her book, Jeune Fille, the actress talks about the filming and the strange link, created through influence and seduction, that Bresson forged with her. A coming-of-age story which reflects the scenario in the film where Marie wavers between faithfulness to Pierre, her childhood love and the powerful desire that she feels for the violent Gérard. Like Balthazar, this black and white film, which seems out of sync compared to the aggressive modernity of the sixties, is a reference film. In it, the filmmaker, watches the passing of a timeless France, where the donkey cart sits alongside the moped, where flowery aprons meet leather jackets. The sound track crafts the juxtaposition between bird song, Balthazar’s braying and car engines or backfiring motorbikes, while the music contradicts a few notes from a Schubert sonata with jazz by Wiener and the hits that slip out of Gérard’s transistor radio. Several fleeting images arise from this Dostoevskian universe dominated by human darkness, the perpetual struggle with evil: the idyll of the children on a bench in the garden, the peaceful countryside bathed in sun, the strange ceremony where, in the barn, Marie crowns Balthazar with flowers before giving him a loving kiss, in the middle of the night. Françoise Zamour, a previous student of the École normale supérieure de Paris, graduated with the Agrégation in Classical littérature, is a Doctor in cinematographic studies and the Director of Études de lettres at the École normale supérieure of Paris.